For my second workshop with Sara, we were introduced to the idea of Rotoscoping. Before the workshop, we were asked to bring in a piece of footage that could be looped for one second. Rotoscoping – an animation technique that animators use to trace over motion picture footage, frame by frame, to produce realistic action. Originally, animators projected photographed live-action movie images onto a glass panel and traced over the image. 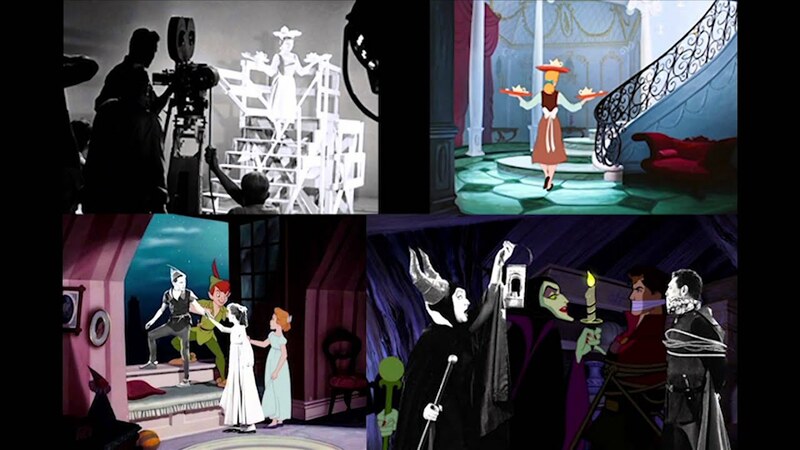 As I started to look into the idea I found that Walt Disney used Rotoscoping in the early Disney films including Snow White, Peter Pan, Cinderella and more. I found this really interesting as I never understood how they made these films, I always assumed and being a big Disney fan this is something really fun that becomes an eye opener towards the way I look at my work and the things that can be achieved. I found this most interesting as I have visited the gallery of Walt Disney in Florida and I saw these similar images, I also watched several documentaries where this concept is shown however they never mentioned the name of this technique which left me confused as to what this was and was this something real that was even used. It is interesting to see how similar the real-life characters are to the final outcome of the animation. From this, it is easy to see how humans carry a lot of characteristics that can be transferred to these characters. Without this person acting this gesture out the animators would be guessing how Cinderella would walk, how she would carry, how she would place the tray down and so on so it is interesting to see how humans have a big importance when making these films. For the footage, I have used a one-second loop of a male lifting his leg back and forth. The startup settings remained the same however some preferences needed to be selected to make sure our rotoscoping worked with no problems. To work with rotoscoping I used the pen tool to go around my figure, I changed between the selection and pen tool so I could move around the frame. Each frame had to be cut out individually but luckily due to my figure moving ever so slightly, in some of my frames, I was able to move stuff up rather than starting again or changing a lot of my points which sped the process up. This was a repetitive step which sometimes felt like I wasn’t getting anywhere, however at the end when I finished the rotoscoping, it came together and I was really shocked with the effect of this technique. I worked with one mask throughout my piece as my figure wasn’t holding anything, therefore, I didn’t need to over complicate things. We worked with the After Effects dictionary that allowed us to add quick After Effect expressions rather than having to remember the code. This is really good and useful so I wouldn’t have to remember every piece of code and I could also explore into this and try some of the new expressions out. I was surprised at how important Rotoscoping is. I had no idea that this was used in the early developments of Disney films and it has opened my eyes more to what can actually be achieved. I also was surprised when I saw the final outcome as I didn’t expect it to look the way it did. I found it hard importing my footage into After Effects. Sara helped me and explained for some reason a glitch happens and wants you to export it in Quicktime before importing, I have made a note of this for in the future. I also found that when doing this technique I need to make sure I am as close to the figure as although I am happy with my video for the first time, I also found that the edges of the background are slightly visible. I should have used the technique where it gets rid of the background to see this before carrying on, I will take this away with me as a learning curve and continue to move forward applying this again. Rotoscoping (Sara Workshop 2 Y2) from Amy Winson on Vimeo. I loved this workshop. This is definitely one of my favourites since I have been at University, I loved exploring and researching into the context behind this and it made sense why we were asked to use figures. I found the workshop fun throughout and this has made me come away with an open mind and how I can apply this technique further in my practice. I decided to go back and try this new technique out as the workshop goes so quick and we learn so much that it is very easy to go away not do further work and then completely forget what I did. I also really enjoyed this workshop and I am excited to try some new things in After Effects. I took a similar clip however of his arms raising in the air. I decided to complete fewer keyframes but focus on making these key and taking my time cutting them out. I also decided to add a piece of music to my new animation and work with incorporating a technique from the last workshop. Learning these new techniques makes my time in After Effects a lot easier and things I use to struggle to find are easier and visible the more time I spend in the programme. For my new animation, I followed all the same settings and had no problems. I feel very confident with the setup and render settings which is a big bonus for me as now it means I don’t need to keep looking back and forth at my notes to do this. I did begin to look at my notes when it came to the import settings of my video and what to turn off in the general tab. I worked with the pen tool and again as I said above, I did find it really hard to cut out exactly the figure and not get any background in but I went back and worked as precise as I could to avoid this. I decided to add a bright neon green background to contrast against my figure and make him stand out more. The piece of music I played behind the animation set the tone and made it really fun. Also because I was trying to focus more on the technique, I decided to work with duplicating the figure and placing him all over making the animation feel more grungy and fulfilled throughout to make it feel random and make the viewer question what is going on. Each frame is completely different from one another which makes me really like this clip even more. I think the music really sets the tone of the video and has finished it off. I really enjoyed creating this clip, it took me an hour and a half to create, I timed myself to get an estimation of how much each frame can take. To finish I also added the Venetian blinds which fade ever so slowly at the end to set the mood, I loved being able to not have to keep reflecting back on my notes because they extra content I am creating is staying in my head from repeating it again. I worked with not as many frames as I did in the workshop video and it just shows how time-consuming yet effective rotoscoping can be. I am excited to move forward with this tehcnique in my next workshop. Rotoscope 2.0 from Amy Winson on Vimeo.